A free boat will take you to a not so free mall of sorts. At the pier across the river you can catch a river taxi to Asiatique, an indoor outdoor mall complete with high end restaurants, outdoor theatre, music, stalls with all kinds of wares, and yes a ferris wheel. A large ferris wheel, one that had me squirming in my seat as it slowly rose over the river. Heights! Hah, who’s afraid of heights? Well I guess I am. Weird. I have skied down mountain chutes that are so steep you cant even see the bottom from the top. Grand Canyon? No problem peering over the edge into the abyss that is much taller than this little ole ferris wheel. So where did all this seat moving, sweat inducing, don’t want to look down fear coming from? Beats me. Perhaps it is because it is man made and I have no control. Sounds like an issue my inner voice is nagging me to explore. And explore I did. After a fine meal of royal thai cuisine, accompanied by excellent service in an air conditioned restaurant we set forth to the market. Dari, my english speaking, singing bowl tutor, from Nepal had me exploring the transfer of money from my wallet to his! But this was a purchase I was glad to make. I have wanted a singing bowl for some time. Tibetan Singing bowls,(also known as rin gongs or suzu gongs) are a type of bell, specifically classified as a standing bell. Rather than hanging inverted or attached to a handle, singing bowls sit with the bottom surface resting(usually in your palm if the size allows) You strike it or pull a wooden dowel covered in felt around its rim and it vibrates to the octave the bowl was made for. 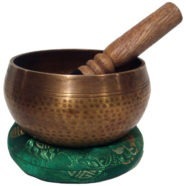 Singing bowls are used for healing, relaxation, and meditation. My frustration was equaled by the patience of my tutor as I could not get any sound to come forth, It wasn’t like I was trying to create fire, or something more complex like a quasar! Finally, I let go of trying and just let it happen. My tutor smiled, Dawn smiled and clapped. And I, feeling like I had made leaps and bounds in mere minutes, smiled. I had that sleek, soulful, saucer…. swaying, swooning, and yes finally singing! As I stared down into my wallet, I knew there was no choice. This vessel would be making the trip back to our condo, and eventually back to our home in Arizona where it will be heard over the desert night, and the cry of the coyote. Fear, frustration, satisfaction, and self indulgence had all taken their turn tonight. When we returned home I sat in our window nook and stared out at the city. Bowl in hand I waved the wand across its rim. The sound of life came forth. Magic was in my hands.